Posted by AllisonO & filed under Our House, upstairs upgrade. Alternately titled: How we aren’t getting it all done. I feel like our family has been running at full tilt since… since… wait, what day is it again? For a week last month DanO served his civic duty as a juror (except it looked less like juroring and more like waiting in a big room to be called to a trial) which meant he was getting up before 6am, going to work for 3 hours, reporting to the courthouse by 9, and not being dismissed until 4:00pm. It was the crazy. All the while we’ve been growing toddlers and growing babies and growing our second story remodel. DanO is currently balancing several full-time jobs. Several. Husband, Father, Software Developer, House Remodeler. He’s pretty busy. Which means OBaby and I are pretty busy, too. Saturdays are an assumed work day around here. It’s just another weekday for me as far as schedule (get up with OBaby, breakfast, play, lunch, nap, etc.) except DanO is upstairs instead of in the office. And he comes down for lunch, which is fun. 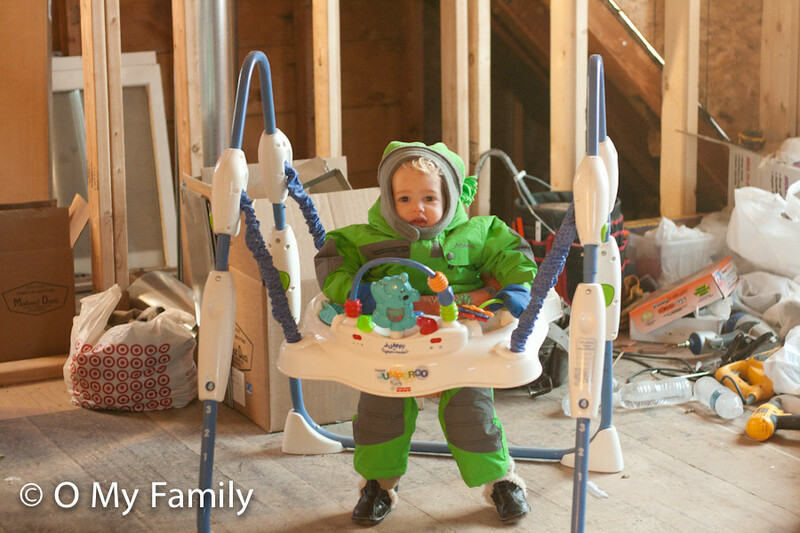 Most weekday evenings, DanO gets home from work before 4pm (because he gets there at 6am), puts on his work clothes, suits up OBaby in his snow gear, and the two of them go upstairs to work. 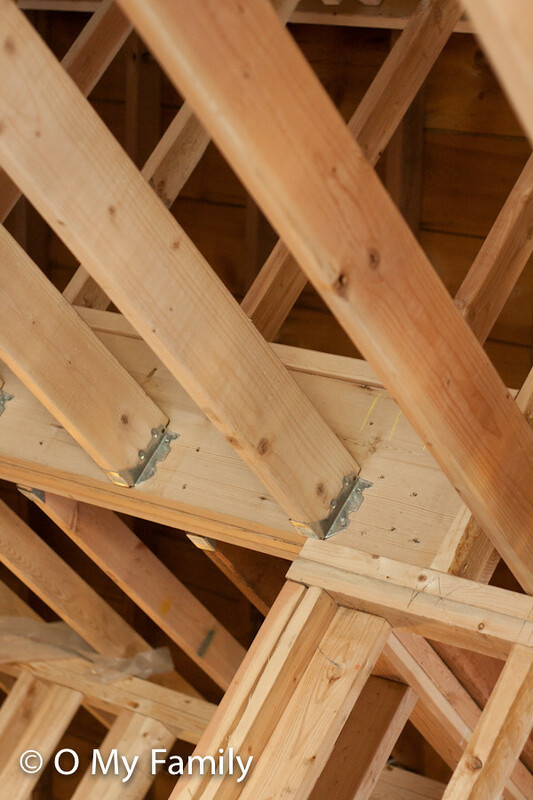 It is still mostly uninsulated up there and with highs in the teens lately here in the great white north, this upstairs remodel has been a chilly endeavor. Not that OBaby really minds, all snuggled in his snow gear and in the middle of the action, watching his daddy’s every move. He even often claps for DanO and we have taught him to say “WOOOOW!” at opportune times. OBaby makes an excellent morale booster. And we need all the morale boosting we can get. It’s hard, honestly, to see the upstairs still looking like it does. Everything is framed and the bones are all there, but it still takes large helpings of imagination to see things as they will be. In my typical instant gratification way, I want to see sheetrock on those walls. And carpet! And tiles in the bathroom! And paint!! O, PAINT!! But instead of tile, this is what the floor of my bathroom looks like. So we have a little ways to go. But as I have learned from these projects over the last two and a half years, sometimes the biggest progress can’t be easily seen. 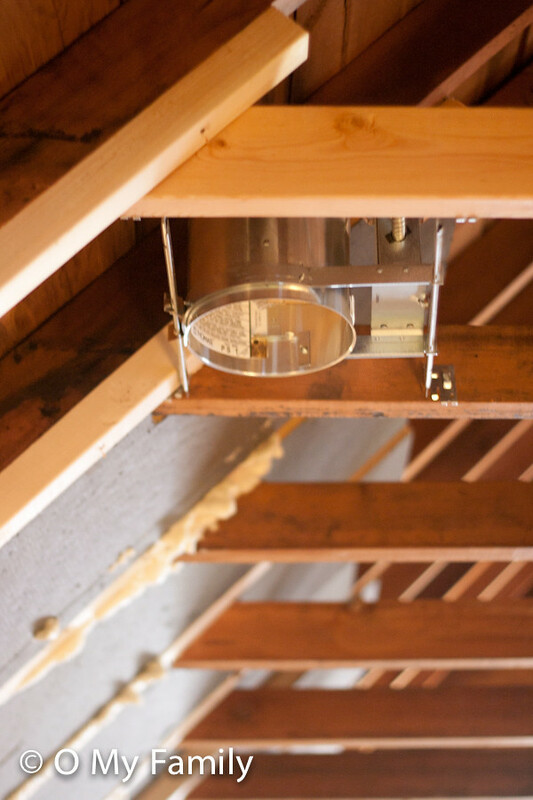 The things that stop us from being able to put sheetrock on the walls are those little things that don’t look impressive but are very, very important. Like having electricity. Having electricity is important. …so that we can have lights. 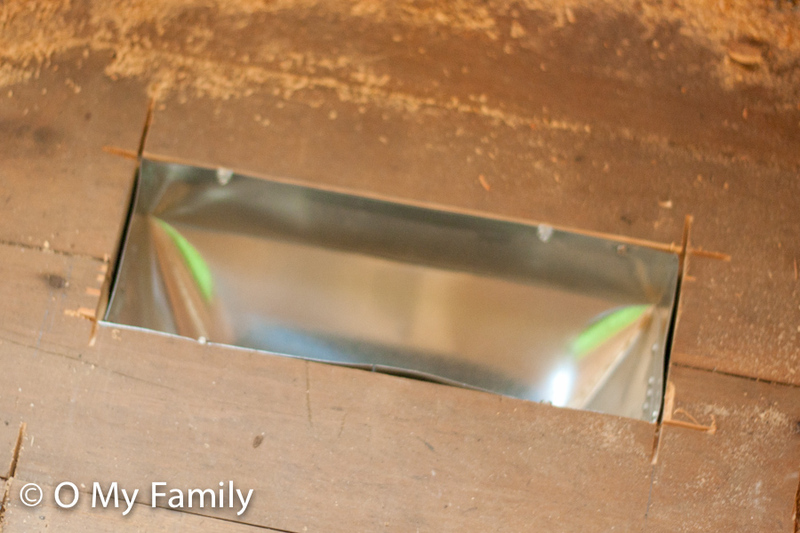 And having duct work is important so that we can get the heat and air conditioning in the rooms. 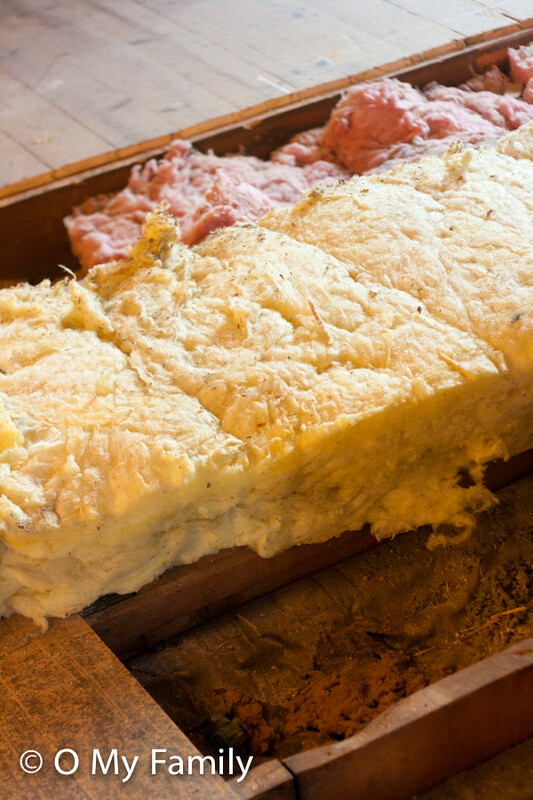 …and insulation in the exterior walls is important so that that hot or cold air stays in the house. No, it’s not particularly exciting to cut sheets of closed-cell rigid foam board insulation to fit between rafters, but it is necessary, and it is progress. Sure, maybe it took us for.ev.er to figure out how to get the recessed lighting housings properly centered on the hallway because of the crazy slanted ceiling, but we’re making progress. 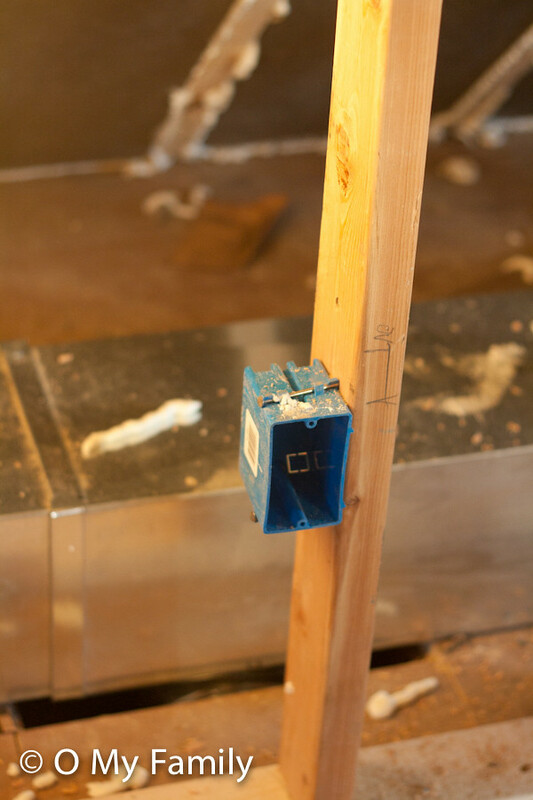 And perhaps little blue boxes nailed into 2x4s don’t make my heart race, but I will be able to plug in and use my hair drier someday, and that’s important. So… progress is progress. And while we’re making it we’re busy. Days, evenings, weekends. Busy. Trying to get it all done. O, how did this get here? Sorry. This one was for my private collection. Please disregard. First off, you’re so cute! I love how you love your husband. It’s so refreshing! So many women can only find things to complain about. I know I can find plenty to complain about, and I’m sure you probably can too, but it’s clear in everything you write and do that you love him. And I love that! Way to go getting all that work done and keeping your head! My second little one is due in 5.5 weeks (my daughter is 20 months old) and I’m having a hard time getting everything scratched off my to do list. Thanks for the inspiration to keep on keeping on and seeing the little progress! I agree with Savannah! It IS so refreshing to see and hear the love you two have. Those pics of o’baby in his jumper all decked out in his snow gear are a riot! Now THAT is some creative parenting. And no small act of genius on your part, either! Hehehe on the last photo! BTW, thanks so much for your encouragement via email a couple of months ago. Right now I am doing so well with regards to PPD. Life is so much better. This is going to sound crazy but having lived through a remodel with an 8 month old myself …I think you are doing this at the perfect time ;) because you will want to focus on two babies and get on with your life as a family of 4 in adequate space.Now that I have two kids I’m so glad for all of the extreme nesting that we did so that I can be in a house I like for the season of life when we are home a lot! Oh my. I could have written this post myself. We’re going through a remodel right now, with a 20 month old and me pregnant with our second. Its hard. Thats all I can say. And my husband is like yours- the man has like 4 full time jobs, with the real money paying job, the house remodel, the winter sports, and the charity he runs. Sheesh. I feel the need to get a hobby or two myself. I’m hoping, praying that we can get it done before the baby comes in July. And I told him next winter, he needs to cut back. We’ll see how that goes. :) Good job at keeping the grace through it all. I know its not easy, but we do whatever we can for the good of our family, right?? Can’t wait to see the end result, it will all be worth it! You are so cute! Your positive attitude is such an encouragement. 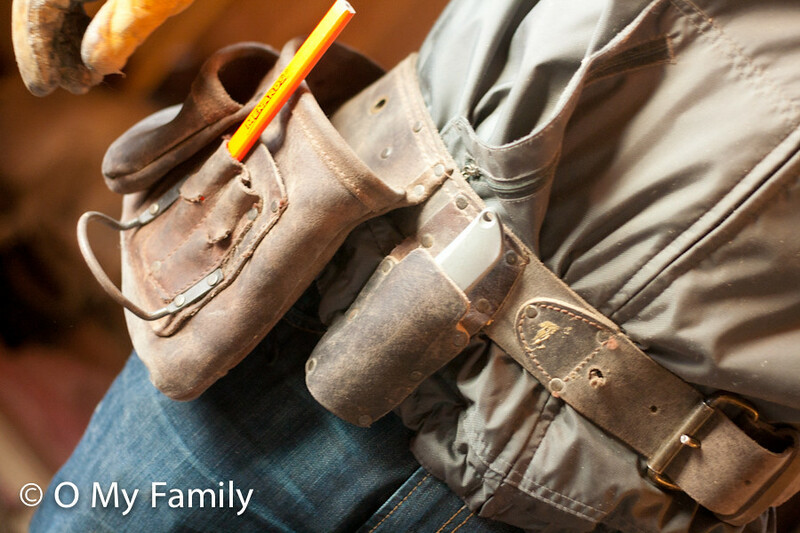 Building/remodeling seems much like rasing children; there is a lot of “inside work” that needs to be done, progress might seem slow but doing it right is so necessary. My husband did a lot of this also on our first house, second, third, fourth, fifth, well, he is handy and I love how he knows how to do this sheetrocking and all. It amazes me. He is also a perfectionist so it looks great when he is done! Thankfully we have more money than time most days so were able to hire sheetrock, mud and tape and carpeters for the latest basement project! We have been married over 16 years so you will get there. I thank God for motivated husbands! I love your writing, your honesty and your joy at being surrounded by guys! You’re right — the smallest things make the biggest difference. 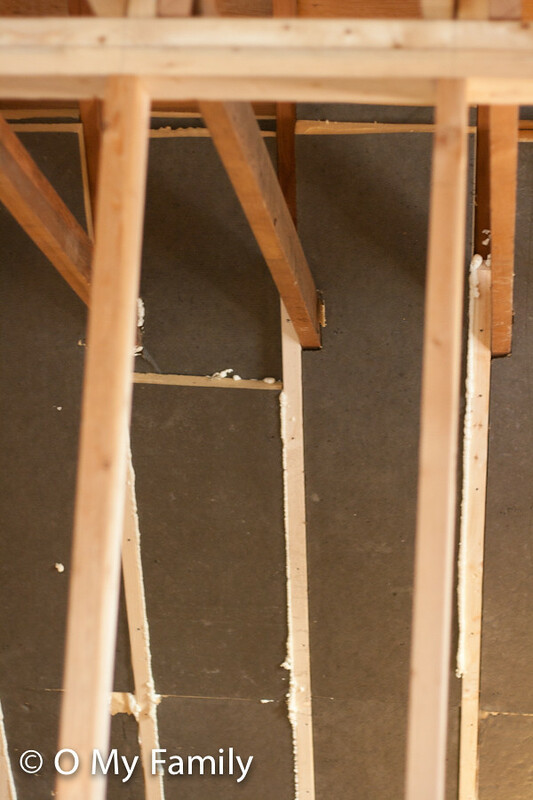 When you see drywall on the wall frames – the end of the project is near. It will all get finished! We just survived a basement remodel (it was completely unfinished, and now it is! YAY!) that only took…8 months…ugh! Just keep the big picture in mind: it will get done! O my! OBaby is so daggum cute in his snowsuit and hat! My son glanced over my shoulder while I was reading your post and thought he looked like Buzz Lightyear! We built our house when our kids were 3 and 2 and had our third on the way. It’s no easy feat, but we survived, and I’m sure you will too! Good Luck! LOL @ the last picture and sentence. OBaby is SO DANG CUTE !!!!! Kudos times 10,000 to you for doing all you are doing, even while pregz with #2! I have a 13 month old, and #2’s only 8 weeks in the slow cooker…but I spend all my time either moaning on the couch or hovering over a bathroom appliance begging for my life to end. So seriously…you’re doing great to be doing what you are doing, and loving on your men (L’il O and DanO) like you are! By the way, at first glance i thought the picture of your bathroom floor was a picture of some kind of egg/ham breakfast dish. Ha! Good luck with the remodel!!! you are so cute. when Dan O is done with your second floor, do you want to send him here to work on our basement? it’s much less work…everything is already framed in and we have insulation…we just need electrical, plumbing, and dry wall. easy, right? also? the last picture? you are just so cute, you. can’t wait to see it when it’s done….there has been lots of progress since last time I saw in a post. Oh, goodness. 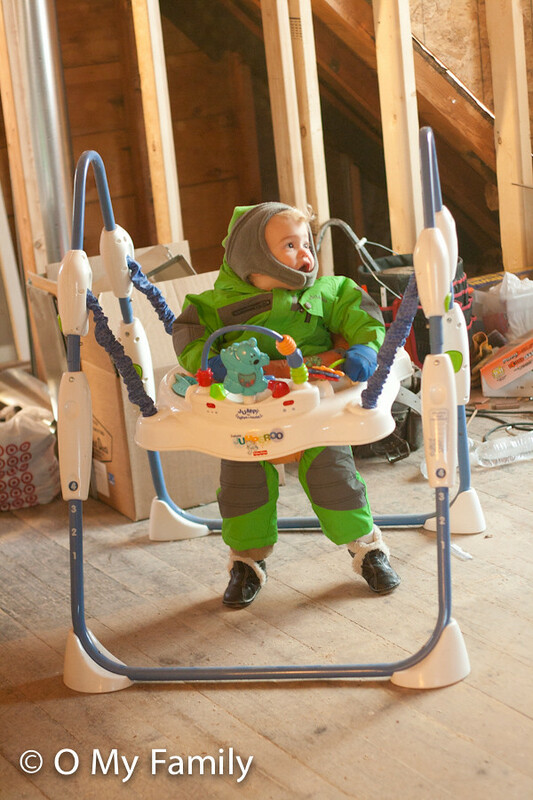 Love those pics of a snow-suited baby in the exersaucer. Bet you didn’t think that this post would make someone tear up, but, o, it did! My husband is also working a remodel (not our house, but many many states away) and I too am having a hard time being patient. I’m waiting for the sheetrock and new carpet and paint too, what do you MEAN you are wiring in more outlet boxes?! This post hit very very close to home. I’m going to share it with my husband.